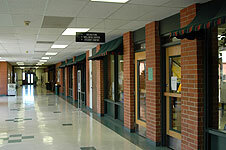 The Student Store is located on the south side of the main building, across the hall from Pioneer Point. Operational hours are from 7:30 a.m. to 5:00 p.m. Monday through Friday, with extended hours at the beginning of each semester. 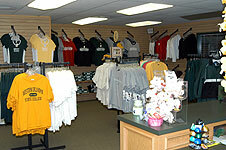 The Student Store carries a full line of required textbooks/class materials, miscellaneous supplies, and school spirit items such as t-shirts, sweatshirts, jackets, etc. No refunds will be given after the official college late enrollment period (first two weeks of the fall and spring semester, the first week of the summer semester, and the first week of shortened format courses). Textbook refunds will not be issued for transition courses once classes begin. Request for refund is made within period noted above. Must have original sales receipt. Textbooks are in original condition. All pre-packaged materials must be un-opened. Refunds will not be issued if shrink wrap is broken or removed. Special orders are non-returnable/refundable. They require a ($20) deposit which will be applied to final purchase. Deposits are forfeited if the item is not picked up within 30 days. Clothing and other supplies, in original condition/packaging, can only be exchanged within 30 days. Original receipt is required for ALL returns/exchanges. *NOTE: Refunds may be subject to a 20% restocking fee. Current editions of used textbooks are purchased from students for a five-day period (two days in summer) at the end of each semester, during WOSC's official final dates. All dates and times of book buy-back periods are posted at the end of the semester. Most textbooks purchased for WOSC are purchased at one-half of the current selling price. WOSC may also purchase books for wholesale companies at their determined price. The Student Store reserves the right to limit the number of textbooks purchased for each course and to buy back only those textbooks in resalable condition. Active Green Bucks card required. For more information about the student bookstore contact Kass Deweese.